Occasional nights flirt with freezing but winter seems on the run. Garden fever is in full swing. One new rite of spring garden planning is starting my pepper seeds. I have bought transplants for years as seed starting is normally a disaster for me. 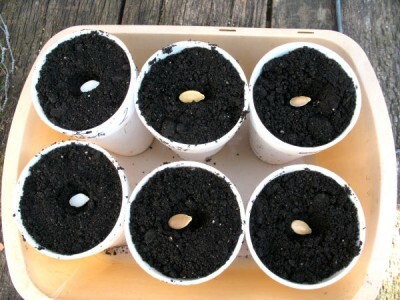 Starting seeds requires fairly steady warmth, not always possible in a wood heated house. Even more importantly it requires light. This is not easy for me to supply. 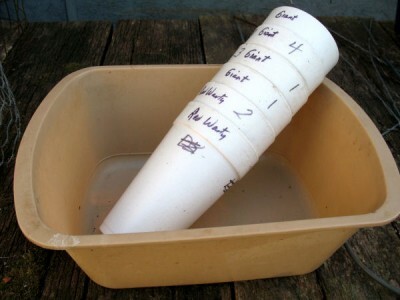 Seed starting supplies for me are Styrofoam cups with holes in the bottom, plastic trays, potting soil and seeds. I love growing colored bell peppers, especially the chocolate ones. These transplants have been unavailable for years. In desperation I bought seeds last year and started my own. Living in a frost pocket, my main summer garden doesn’t go out until the end of May. I get tired of the blanket over seedling routine that I go through religiously then miss that one crucial night. Six weeks before end of May is mid April. Days are warm. 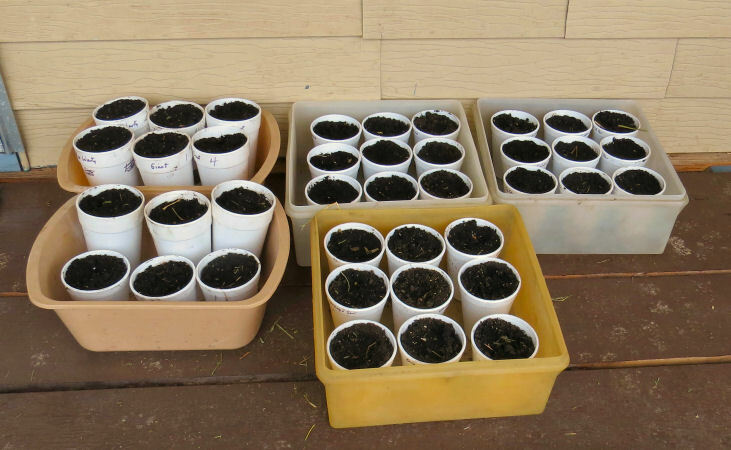 The front porch is a great place for seedlings. Sheltered. Warm. Lots of light. The seeds are in the potting soil in the cups ready to be covered up and watered. These were two Red Warty Thing pumpkins on left and four Weeks Giant Pumpkins. After last year’s success, I decided to get bold this year. There are lots of cups of pepper seeds on the front porch now: chocolate, lilac, white, gold and orange. There are even Italian sweet and prize winning banana peppers. However cooler weather moved in so the trays moved into the house for now. In deference to completing pictures for “The Pumpkin Project,” there are giant pumpkins and red warty thing pumpkins too. 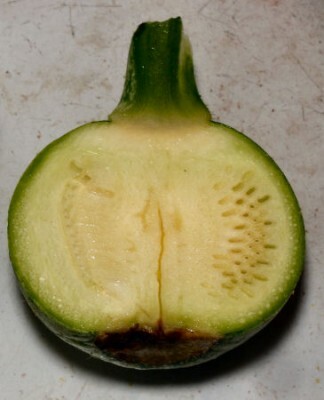 Since bell peppers inhabit my garden, the Italian sweet and banana need to grow elsewhere. I have only one garden. Last year they ended up in pots and did very well. After watering, the prospective pepper and pumpkin plants are lined up on the front porch. The blanket over them had some straw bits on it. Container gardening? It’s just sticking plants in pots, right? Not according to “The Vegetable Gardener’s Container Bible” by Edward C. Smith. Just like straw bale gardening, I have no intention of converting my garden over to containers. I like my garden. However containers do have some interesting uses and the book has many interesting ideas in it and I’m not done with it yet. Houseplant repotting season is opening this weekend here. Armed with some new ideas my poor neglected houseplants may get better living quarters. They hope so. This entry was posted in High Reaches and tagged bell peppers, garden, giant pumpkins, starting seeds on April 15, 2015 by [email protected]. I taught science. I loved teaching science. This book was born out of that love. Another favorite activity is gardening. I’m not a great gardener but enjoy being out growing or trying to grow plants. Pumpkins are fun to grow. Like in “Goat Games” puzzles are part of this book. There are 19 puzzles finished. The mazes and coloring pages are not done yet. All relate to pumpkins and squash. Like in “Goat Games” interviews and stories about pumpkins are in the book. It was fun doing these as I wrote and met people who love to grow giant pumpkins. These are the ones that set world records. The newest record is for a pumpkin grown in Germany weighing over 2300 pounds! How do you grow a pumpkin this big? Why would anyone want to grow a pumpkin this big? Find some answers in “The Pumpkin Project”. Some of these stories are too old to use, perhaps. Most are still interesting. Unfortunately pumpkins are a fall crop so I can’t redo these stories until this fall. Like in “Goat Games” I included recipes. But “The Pumpkin Project” has a recipe section. There are lots of pumpkin recipes from soups to pancakes to breads and muffins to pudding and pie, even cheesecake. 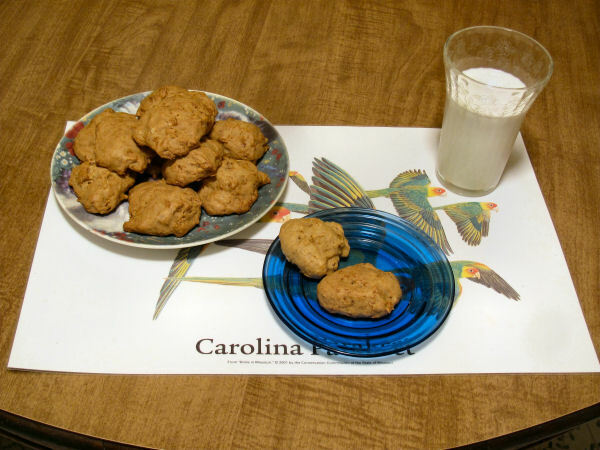 My favorite pumpkin cookies taste like pumpkin pie but in a soft chewy cookie. Several of these recipes are ones I still make from time to time. But I have yet to make one or two. Luckily I still have some pumpkin puree to use. Most of “The Pumpkin Project” is about the pumpkin Investigations. There are 19 Investigations and 2 Projects. The Investigations begin with looking at seeds and end looking at pumpkins. The Projects are growing and using pumpkins. What is it? A baby pumpkin. Do the pumpkin Investigations and find out about pumpkin seeds, sprouts, plants and, of course, pumpkins. If you have checked out any of my science projects in the Project Corner, you know I like to have pictures showing the Project being done. I made some changes in the pumpkin Investigations and need pictures. There is a problem. Pumpkins grow in warm weather. Snow is not helpful. Single digits at night are not helpful. Pumpkins take months to grow. I would love to finish this book this year. But I hate to make everyone wait an entire year to have a chance to enjoy and try out the book. “The Pumpkin Project” will be featured on the Outside Project page this summer. 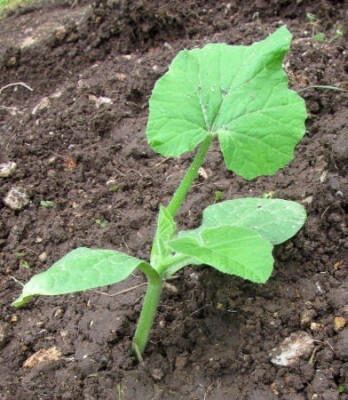 Except you can’t wait until summer to start your pumpkin plants. Mr. Richard Botorff grows giant pumpkins every year and starts them in April. Warm weather is pumpkin growing weather. Get your pumpkin projects started this April. “The Pumpkin Project” will begin in April. The Investigations will appear on the Outside Project page. But the book with all the other puzzles, recipes, trivia and more will be by subscription sent in PDF installments over the summer. The printed book will be sent out this fall to those subscribing then offered for sale to everyone else. Sign ups begin after the “Dora’s Story” giveaways end. 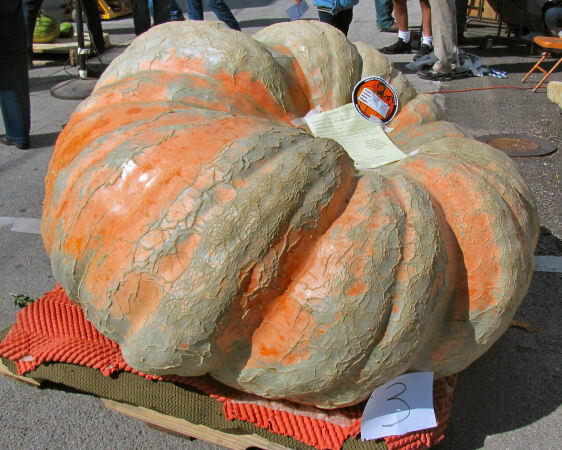 This entry was posted in High Reaches and tagged giant pumpkins, Pumpkin Project, pumpkin recipes, pumpkins on March 6, 2015 by [email protected].